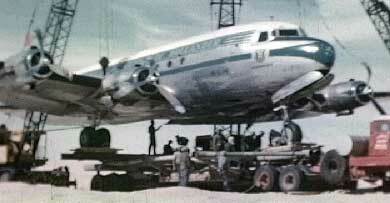 In 1954 a KLM DC-4 made an emergency landing in the desert 15 miles north of Dhahran. Of all the places in Arabia, the pilot probably found the ideal spot to ditch his plane. No one was injured and Aramco was nearby with the men, expertise and equipment to rescue the plane with elegant efficiency. To see the web video of this operation please click below. This footage is courtesy of The Cantrell Collection. It was shot by Dean Cantrell and originally edited by Alice Cantrell. Our thanks to the Cantrells for preserving and sharing these rare moments in the visual history of Aramco and the Kingdom. We would like to thank Tim Barger, publisher of Discovery! The Search for Arabian Oil, Out in the Blue: Letters from Arabia 1937 - 1940 and The Unfurling, by Nimah Ismail Nawwab for sharing this video with Aramco ExPats' Online Community.